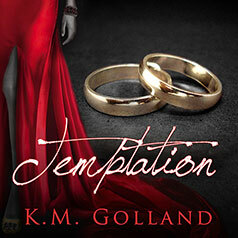 The first in a steamy new series from K. M. Golland. Alexis Summers is happily married and a mother of two gorgeous children. She's been a stay-at-home mum for nine years now, but it's time for a change. Starting a new job with a prestigious hotel, she's excited about her new career. Her boss, the hotel's owner Bryce Clark, is rich, gorgeous, funny, single, and, as Alexis quickly learns, a genuinely nice guy looking for his one true love. The intense chemistry between them is undeniable—but Alexis is happily married to Rick, and no matter how strong her feelings are for Bryce, she is adamant she will not betray her husband and family. She draws a line in the sand but finds it increasingly difficult not to cross. Will she succumb to temptation?